TV makers, especially Samsung and LG Display, are scrambling for changes and quality upgrades for their products. In 2018, the focus of the competition between the two Korean display manufacturers will shift from QLED vs. OLED to Micro LED, as BusinessKorea reported. LG Electronics intends to launch its first Micro LED TV this September, industry sources leaked. 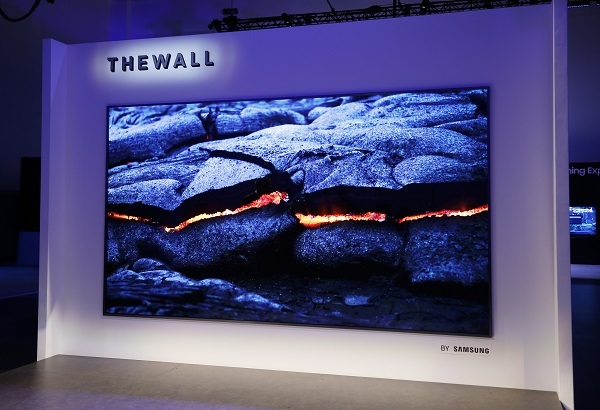 It is reported that Cho Seong-jin, Vice Chairman of LG Electronics, on February 21 told the staff to develop Micro LED TVs larger than Samsung’s ‘The Wall’ modular TV during his visit to the firm’s TV division. The company will use Micro LEDs provided by LG Innotek. Samsung and Lumens, both Korea-based, have unveiled Micro LED TVs over 100 inches at CES 2018 in January. Samsung announced on February 22 that it will phase out the production of OLED TV. Without OLED TVs, the company’s TV lineup will be divided into QLED TVs and Micro LED TVs. The size of Micro LED is averagely smaller than 100µm. Micro LED TVs feature low power consumption and do not have burn-in issues like OLED TVs. If produced with plastic backplanes, they can be flexible. According to the latest report from LEDinside, Micro LED is projected to create a market value of USD 2.891 billion by 2025. As for Micro LED displays for smartphones, they require Micro LED chips smaller than those used to make TV. Therefore, it will take longer to see a Micro LED phone on the market.